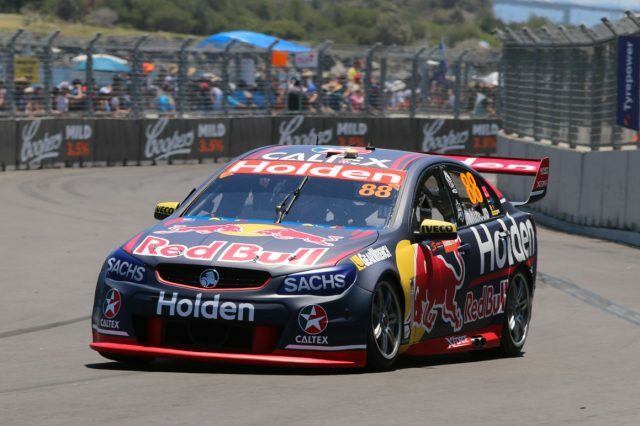 Jamie Whincup kicked off the title decider in fine form by setting the pace in the maiden Supercars session at the inaugural Coates Hire Newcastle 500. The championship leader quickly adapted to the newly constructed 2.6km street circuit as he put in a benchmark 1:10.15s effort in the dying moments of the 40 minute session. Whincup occupied a spot in the top 10 for the majority of the running making gradual improvements before delivering his session best time. The six-time champion’s time proved 0.3s faster than Mobil 1 HSV Racing Scott Pye, who was among a group of drivers to improve late in the session. “For sure (there is more to come), I think it’ll be in the nine’s, surely, we don’t have to worry about that time,” said Whincup. “The car’s reasonable, the track is a fair bit different from what we predicted. Today it’s critical to keep moving forward after P1 and then again after P2. “I thought there would be a bit more flow, but it’s actually quite stop start. The grip’s slightly higher than anticipated, and it’s bumper than we anticipated as well. “You drive in a road car it feels fine, you get in a Supercar that’s a couple of inches off the ground and she’s rough. “That’s all part of the character of a street track. It’s going to be a crazy challenge to try and get it right and keep it clean this weekend, but that’s all part of the job. Reigning champion Shane van Gisbergen enjoyed a spell at the top of the times before falling back to third in the #97 Red Bull Holden. “What a crazy track. It’s really cool. It’s going to be hard work, 250km, zero passing spots, which is average, it’s going to be all about qualifying,” said van Gisbergen. Nissan Motorsport’s Michael Caruso was fourth having also lit up the timing screens with eight minutes of the session remaining. Brad Jones Racing’s Tim Slade was fifth ahead of Tekno Autosports’ Will Davison, while title rival Scott McLaughlin was seventh. The Shell V-Power Racing driver was the first driver to break into the 1:11s before times tumbled even further in the session. “It’s full on. That was, just, oh man, I’m buzzing,” said McLaughlin. “It’s so technical. You’ve got to try and work out one corner, you’re sacrificing one corner to help you regain in three corners time. The top 10 was completed by Chaz Mostert (Prodrive), Rick Kelly (Nissan Motorsport) and David Reynolds (Erebus Motorsport). The session ran clean with the only real incident of note occurring at Turn 1 early in the running. Prodrive’s Mark Winterbottom misjudged his entry to the corner and found himself down the escape road. Moments later Nissan Motorsport’s Todd Kelly did the same and made slight contact with the Ford driver as he tried to recover to the track. Meanwhile, Cameron Waters (Prodrive) suffered a throttle issue that limited him to only 14 laps. The Supercars field will return for a second 40 minute practice session at 1455 local time.